Gardening with kids is being taken to a whole new level at the HawlemontElementary School. They have received a grant that is allowing them to establish themselves as an AgricultureElementary School. This means that the schoolyard will have a variety of raised vegetable and flower beds, including a story garden that is being sponsored by the school library. But the schoolyard will also become a farmyard with a cow, sheep, goats and chickens. And yes, that means a barn and chicken coop. Jean Bruffee currently teaches second grade, but next year she will be the Coordinator of the HAY (Hawlemont Agriculture Youth) program. When I spoke to her she said, “Every grade will have an agriculture class every week next year, and children will have chores. We are already putting up hooks for the farm clothes, and they’ll also get a pair of farm boots.” But she explained that studies will also include environmental and sustainability issues. “The barn will have a weather station,” she said. She also assured me that while the animals will go back to their home farms in the summer, families and teachers are making commitments to care for the gardens during the summer vacation. Working with our children in a home garden can be a lot of fun, but sometimes it is hard to gauge what children can understand or how far their capabilities might extend. To help parents and friends make a start two new books came out this spring to provide help and inspiration. Those who are familiar with Mel Bartholomew’s unique Square Foot Gardening techniques may be surprised to see how they can lead children not only into a successful garden, but into science and math understanding. 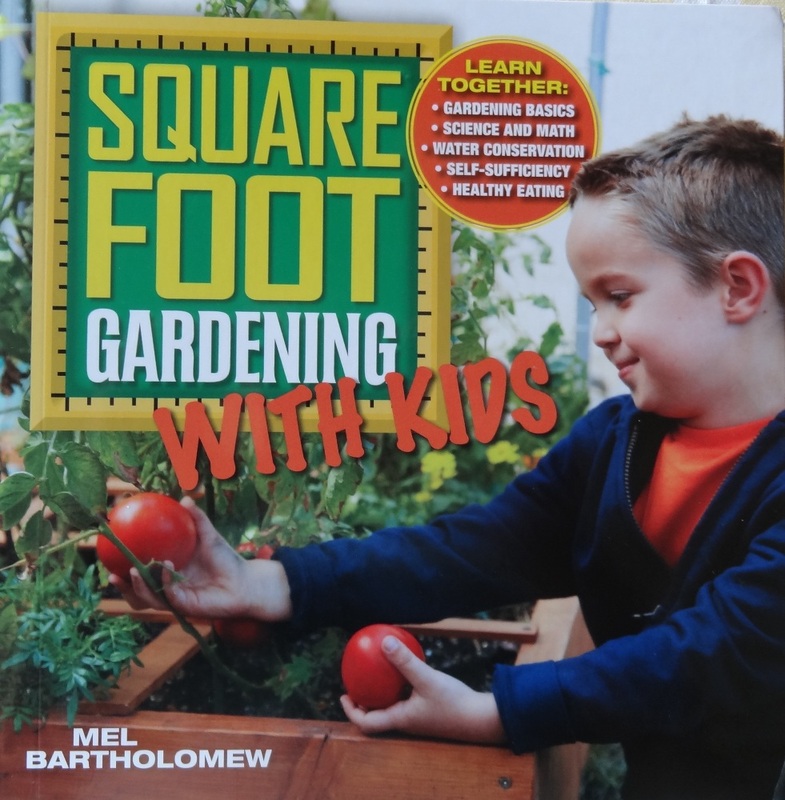 Bartholomew’s new book Square Foot Gardening with Kids (Cool Springs Press $24.99) begins with a sensible overview of how to use the book with different age groups, and continues with basic information for all. Of course, there will be a square foot raised bed box. Immediately we are thrust into a world of fractions. It doesn’t take long to be immersed in a project that requires information, thought, and decisions. The square foot bed needs to be filled with soil, a soil that will provide the nutrition that plants need to thrive. Bartholomew has his own soil mix recipe that he recommends, but on this point I think I recommend loam mixed with a really good helping of compost. Experienced gardeners are so used to reading catalogs and seed packets, making a planting plan considering the arc of the sun and shadow patterns, maintaining a compost pile, making a trellis or two to save room and deciding what to plant and how to arrange the plants in a rotation, that we forget these acts and decisions require a lot of scientific information that is all new to children. Gardening is not just a physical act, it is an intellectual challenge, there is so much to know and consider. I’m still working on the intellectual challenges in my own garden! Bartholomew’s book will be valuable to parents, but it will also intrigue children with various experiments, making functional trellises, and even a season-extending plastic dome. A final section gives growing information about the most common herbs and vegetables. Advice to any new gardener, child or adult, is to keep the beginning small so that it does not overwhelm. 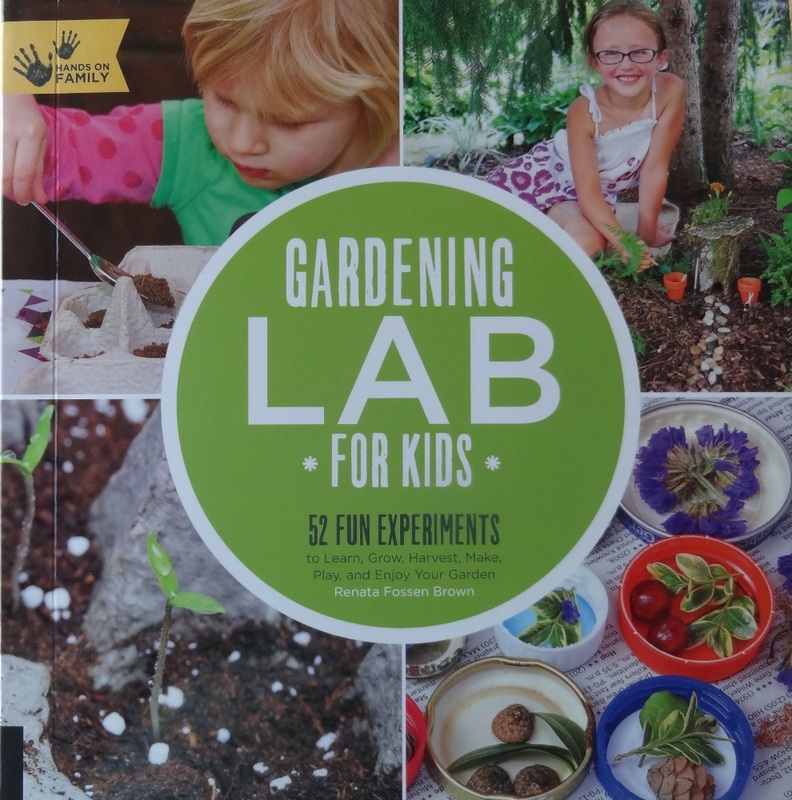 While Square Foot Gardening for Kids is mostly geared to school age children, Gardening Lab for Kids: 52 Fun Experiments by Renata Fossen Brown (Quarry Books ($24.99) is designed to help the parents of young children find their way into the garden with a series of discrete projects. A list of the short chapters shows the variety of approaches from Planting Spring Seeds, Make a Rain Gauge, Plant an Herb Spiral, Make a Bird Feeder and Make a Sweet Pea Teepee. The 52 projects are simple, requiring very few materials. The potato tower is made from old tires, a bug net is a piece of tulle transformed with a wire coat hanger, a nesting material apparatus for the birds requires only a whisk and the materials, and a pollinator palace is made of bricks, pegboard and twigs. Lot of science in all these projects for any age child. Fossen knows that the value of a garden is not only in the various practical functions it serves, but in the space it provides for imagination and rest. Suggestions are made for a fairy garden. I’m wondering whether great-granddaughters Bella and Lola might think the privacy under the weeping birch is a good place for a fairy garden. Fossen also suggests a place to sit and admire the garden. 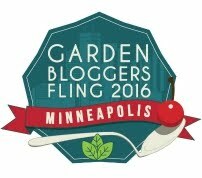 Sitting peacefully and admiring the garden is something we adult gardeners might need some help with. There is more to a garden than chores. Fossen is the Associate Director of Education at the ClevelandBotanical Garden where thousands of children come with their classes or with parents to learn about butterflies and pollinators and all kinds of plants so she is familiar with the many tactile ways children engage with nature and a garden. Do you have kids in your life that you might lead down the garden path regularly, or from time to time? Help and inspiration is at hand.